Andreas Petersen wins the Season 9 Championship! Andreas Petersen advances to the Semifinals! Congratulations to ChannelFireball (Luis Scott-Vargas, Sam Pardee, Josh Utter-Leyton, and Matt Nass), our Season 8 winners! 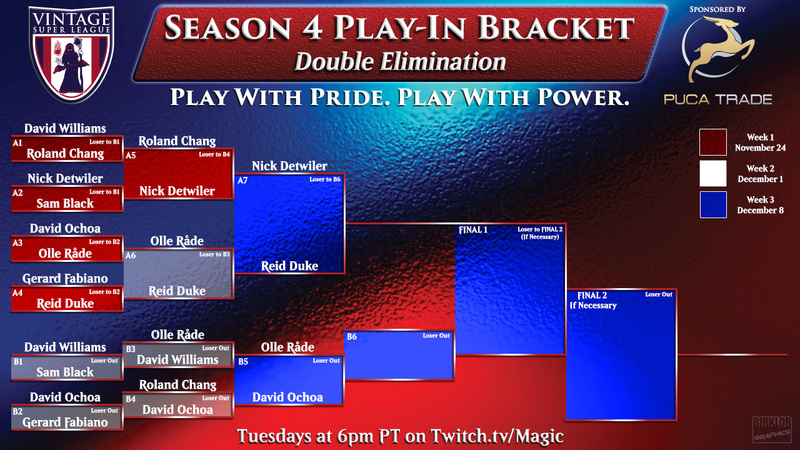 Congratulations to Reid Duke, our Season 7 champion! Congratulations to Oliver Tiu, Season 6 Vintage Super League Champion! Congratulations to Rachel Agnes, who wins the invite to Season 6! M4: Rachel Agnes v Rodrigo Togores- WINNER (2-1) – Winner gets an Invite. M5: Caleb Durward v Rachel Agnes – WINNER (2-0) – Winner gets a bye in the LCQ. Rodrigo Togores qualifies for the VSL! Rachel Agnes wins a bye in the LCQ. Olivier Tiu qualifies for the Vintage Super League! 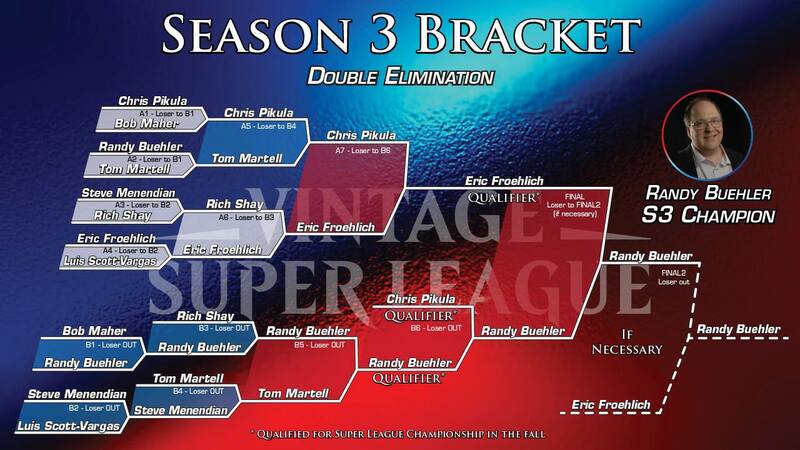 Congrats to our Season 5 champion: Eric Froehlich! Congratulations to Kai Budde, who reclaims his spot in the Vintage Super League! Season 5 began with a double-elimination Qualifier Tournament awarding 4 spots in the league. Congratulations to Paul, Stephen, Brian, and Shuhei. Next week the other 8 players play single-elimination for the final spot in the league. Season 4 will feature a full 10-player round robin regular season, with the Top 4 advancing to the playoffs. Luis wins the series, and the championship title, 3 matches to 1. Luis Scott-Vargas advances to the finals to take on David Ochoa. Luis Scott-Vargas wins the series 3 matches to 2. LSV advances to the semifinals. David Ochoa wins the #1 seed and the bye into the finals. David Ochoa – WINNER (2-1) v Chris Pikula – Originally scheduled for week 8. David Ochoa – WINNER (2-1) v Bob Maher – Originally scheduled for week 7. David Ochoa v Bob Maher – Postponed to next week due to internet connection issues. Congratulations to David Ochoa – the newest member of the Vintage Super League! I’m a fan, but just wondering if there are any kind of replays to watch and enjoy?